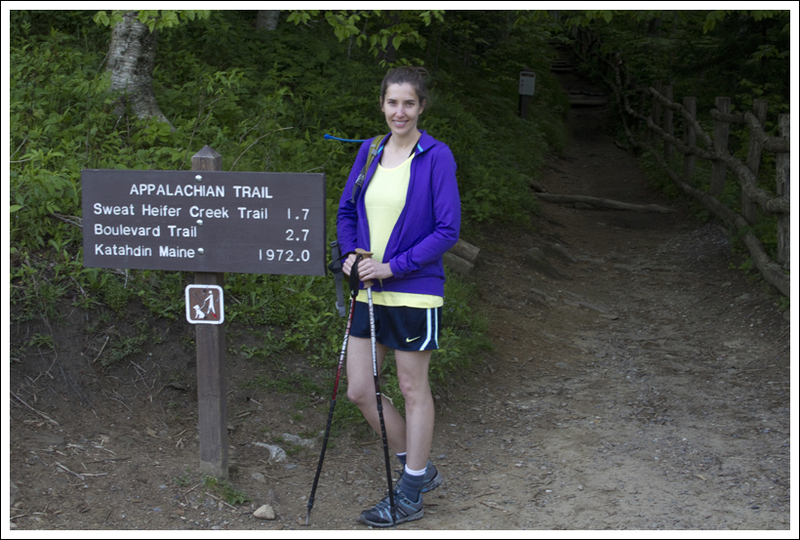 This 9.5 mile hike, mostly along the Appalachian Trail, starts out from Newfound Gap. 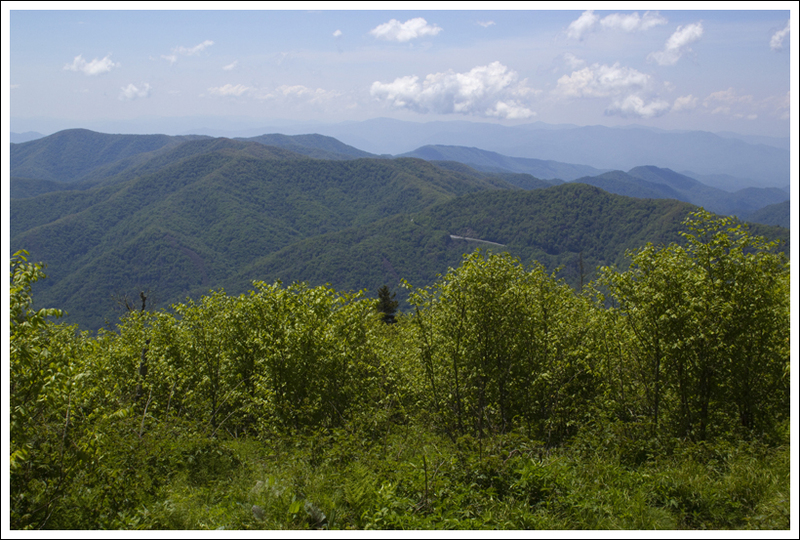 The route offers several places to take in magnificent vistas of the Smoky Mountains. 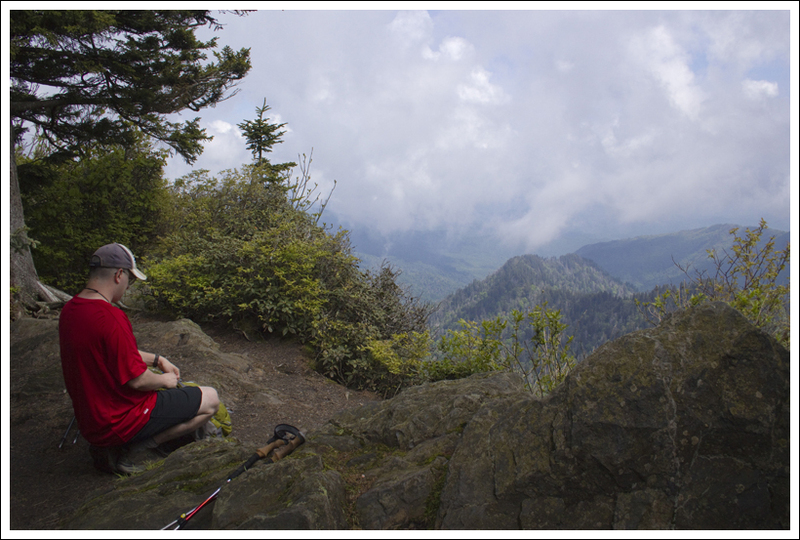 Adam enjoys the view from Charlies Bunion. 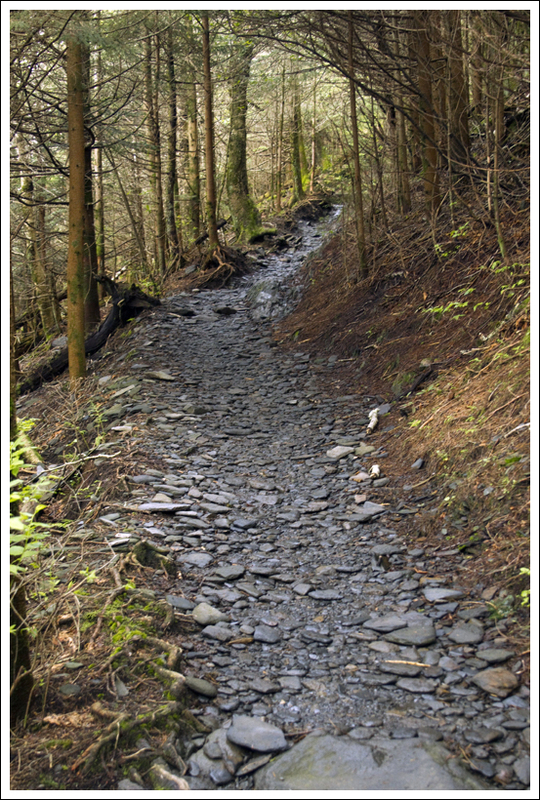 Below: The trail starts out from Newfound Gap. 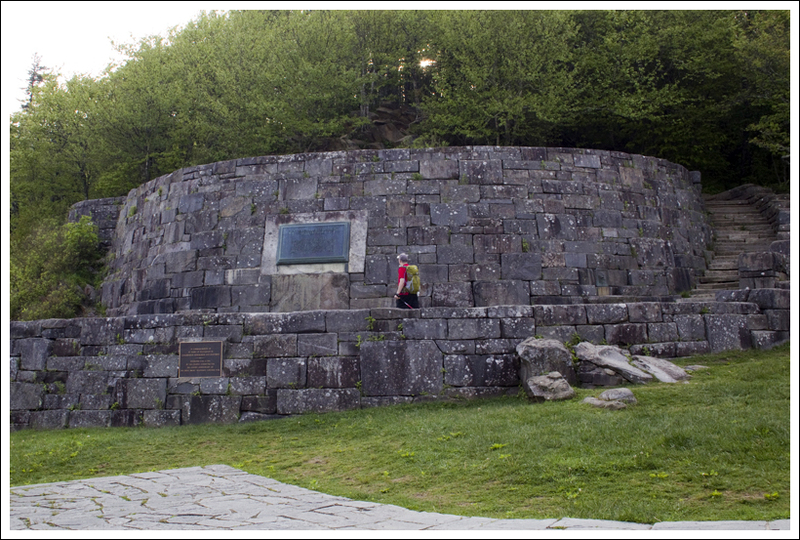 The area has the Rockefeller Memorial (pictured), plenty of parking and restrooms; Christine at the start of the hike; The forests in the Smokies are so dense and green. 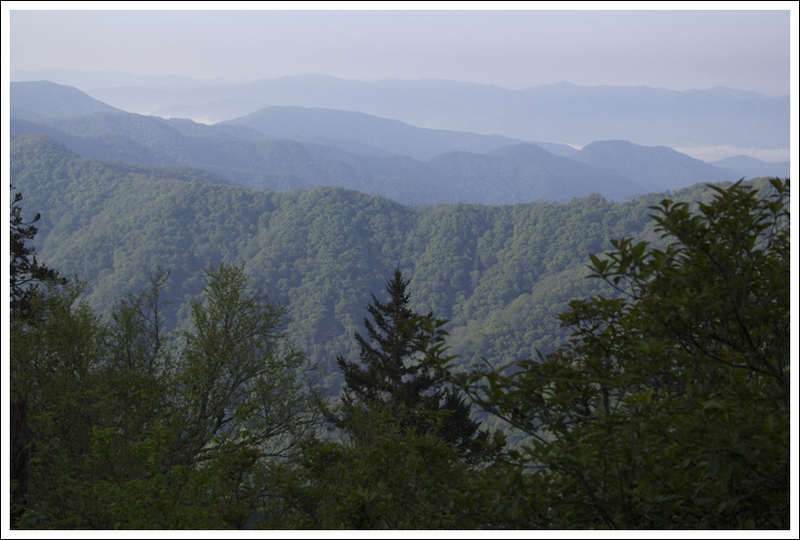 We knew this hike was one of the most popular in the Smokies, so we got off to an early start – breakfast at the hotel, in the car by 7:15 and on the trail around 8:00. We were one of the first cars in the Newfound Gap parking lot, which is always very busy. We headed north along the Appalachian Trail. Immediately, we began to marvel at how different the Smokies are from Shenandoah. I’ll admit, I sort of expected this park to be similar to Shenandoah – kind of like an older sister – bigger and taller, but still similar in looks and personality. But, the trail was strikingly different – more evergreens, wetter, mossier, greener, more rugged – I might even say ‘more alive’. I’d heard and read plenty about the extensive biodiversity of the Smokies before, but wasn’t really prepared by how awestruck the park would make me feel. This park has dramatically more plant and animal species than almost any other place on earth. 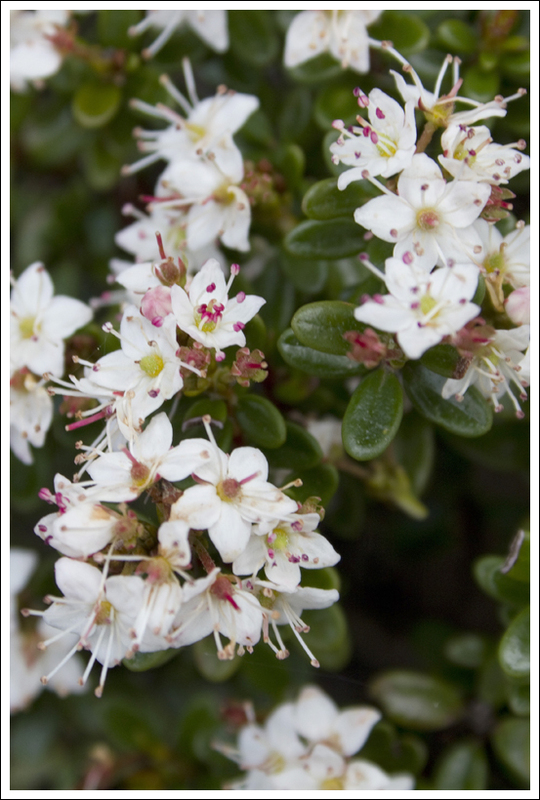 During the last ice age, plants and animals were pushed into the Southern Appalachians as glaciers advanced. 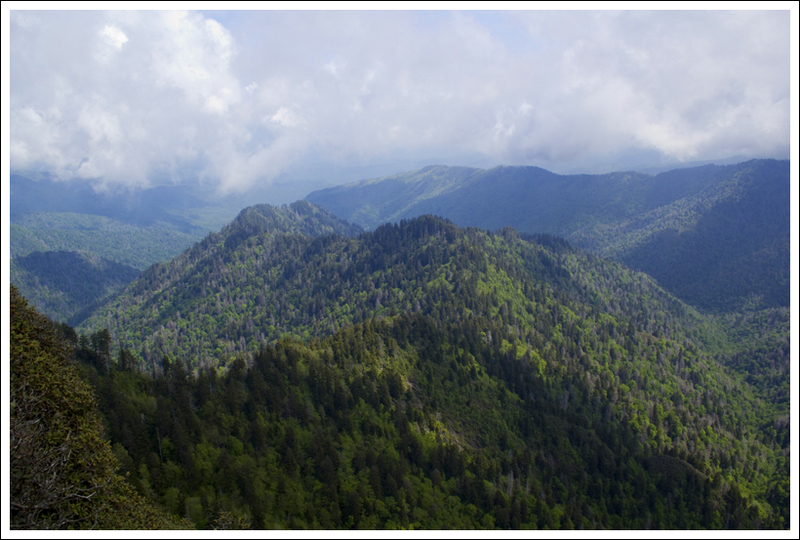 When the glaciers retreated, species were left behind – almost stranded in the Smokies. The trail climbed gradually uphill over the first couple miles, climbing over rocks and roots and mud. Little rivulets of water were running down the mountainside all over the place and filling the woods with the sound of dripping and trickling. Every now and then, we got a view of mountains in the distance. Everything was still partly cloaked with fog and clouds, but it was evident that the sun was making a full effort to burn through. Christine makes her way up the trail. 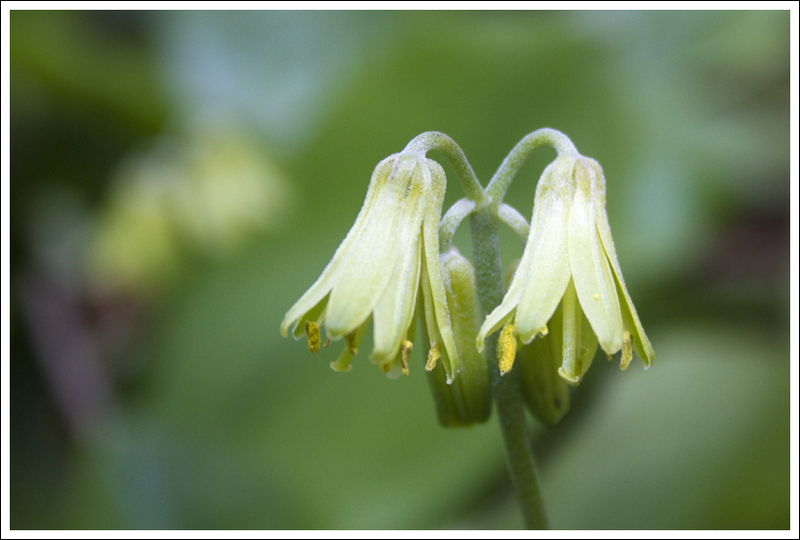 Below: One of the first nice views came at the junction of the AT and the Sweat Heifer Creek trail; Trail junctions were well-marked; There were plenty of wildflowers along the trail. We even spotted a few fading trillium, but they were all pretty tattered and not photo-worthy. At the junction of the AT and the Sweat Heifer Creek Trail (isn’t that a funny name? ), we diverted a short distance off the AT to take in the view. Almost immediately after turning onto Sweat Heifer, there is a bench and a marvelous open view of the mountains. After a few minutes, we proceeded along the trail which had become more level as it followed a ridgeline. We saw a couple trillium still in bloom – one bright purple and one white, but most were far past their peak. Eventually we reached the junction with the Boulevard trail. This is the spot where you can take a detour to another viewpoint – the Jumpoff. We decided to press on toward Charlies Bunion, in hopes of having the spot to ourselves a while before the crowds materialized. About .3 of a mile past the junction, we reached the Icewater Shelter. It was still full of weekend backpackers, some making breakfast and some still in their sleeping bags. We didn’t want to disturb them, so after a brief hello, we moved on. Shortly after leaving the shelter, we stepped over Icewater Spring, which is the water source for this area. The piped spring seemed to be running nicely. I felt a little disappointed about the prospect of missing out on the view, but we stayed optimistic and hoped that the fog would burn off within the next fifteen minutes. 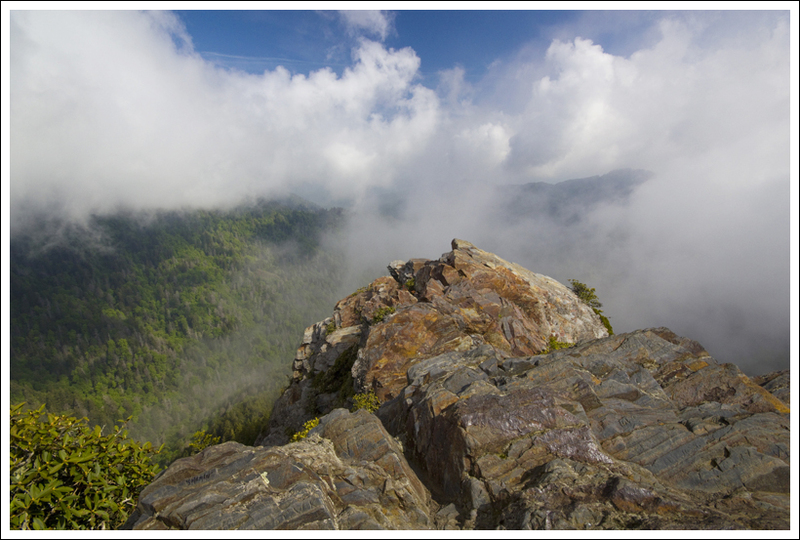 When we first spotted Charlies Bunion from a distance, the fog was swirling around and covering the rocky outcropping almost completely. But, by the time we reached the bunion, conditions were clearly improving. What a spectacular place! The mountains are so craggy and ragged and sharp around the bunion. The rocks were covered with sand myrtle and a few rhododendron were about to bloom. The fog was whipping by, rolling up the sides of the mountains in giant waves. Every now and then, a thin spot would give us a glimpse of distant mountains and not even a hint of civilization. We sat on the rocks, enjoying the solitude. We were absolutely thrilled to enjoy this special place without the company of other park visitors. As the minutes passed, the view became more and more clear. It was everything I imagined the Smokies would be! 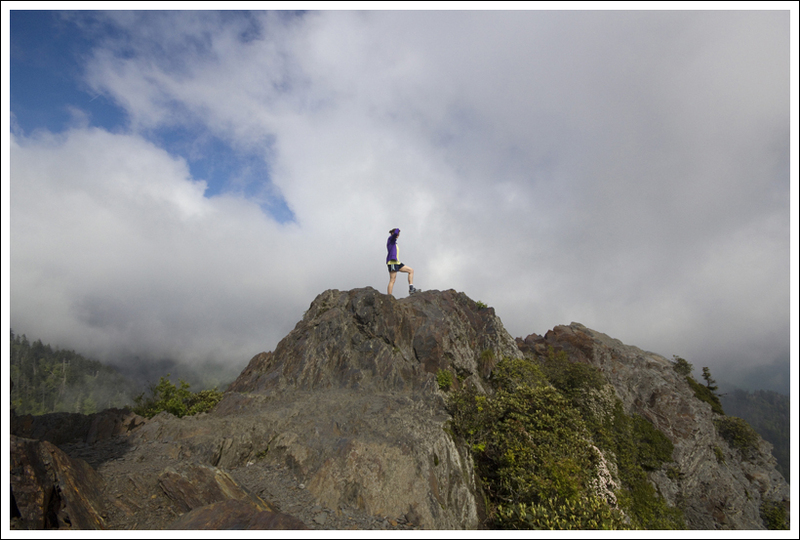 Christine checks out the view from the Bunion. 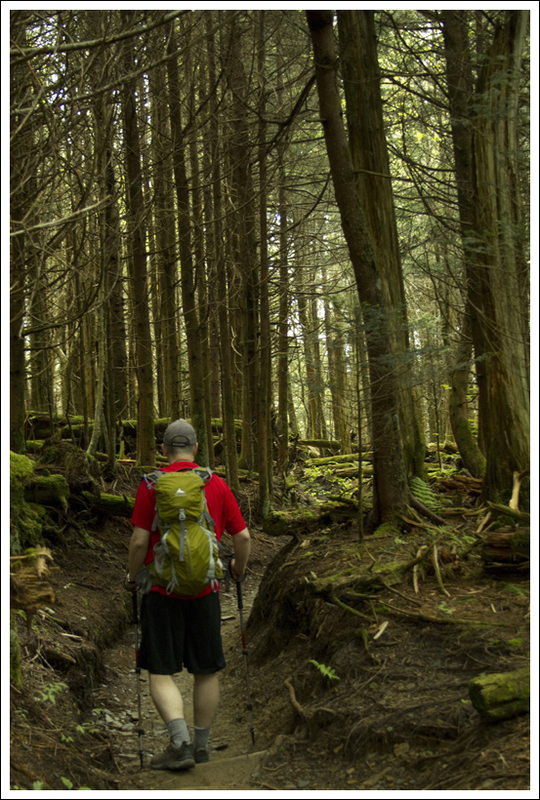 Below: Adam walks through the cool, dense evergreen forest as we cover the last mile toward Charlies Bunion; Some sections of trail were covered with this smooth, slate-like rock; Many high, rocky places in the Smokies (including Charlies Bunion) are covered with sand myrtle. Shortly before we were ready to head back, another couple from Michigan joined us at the rock. We chatted a while and took photos for one another. We decided to head on out and let them enjoy a bit of solitude, too. The side trip to the Jumpoff required about an extra ¾ mile of hiking along the Boulevard Trail and a small side spur trail. The climb up to this view was our toughest climbing of the day. It was steep and very slippery and root-covered. Once we got to the view, it was quite evident why the spot garnered the name ‘jump off’. It has an extremely precipitous drop from the edge! We ate lunch on the rocks and enjoyed the view. On the hike back down to the junction, we passed a huge hiking party and were thankful that we had once again dodged sharing a nice viewpoint with crowds. The rest of the hike back down went quickly and was mostly downhill. We saw dozens and dozens of backpackers and dayhikers making their way up the trail. When we got back to the parking lot, it was full of people taking in the view from Newfound Gap. Most of them will probably never set foot on the trail, and maybe with so many people already out there… that’s just fine! This was a great first hike in the Smokies for us. We had driven up to Newfound Gap the previous day and saw a ton of cars. We knew it would be a great idea to start off on this trail as early as possible. 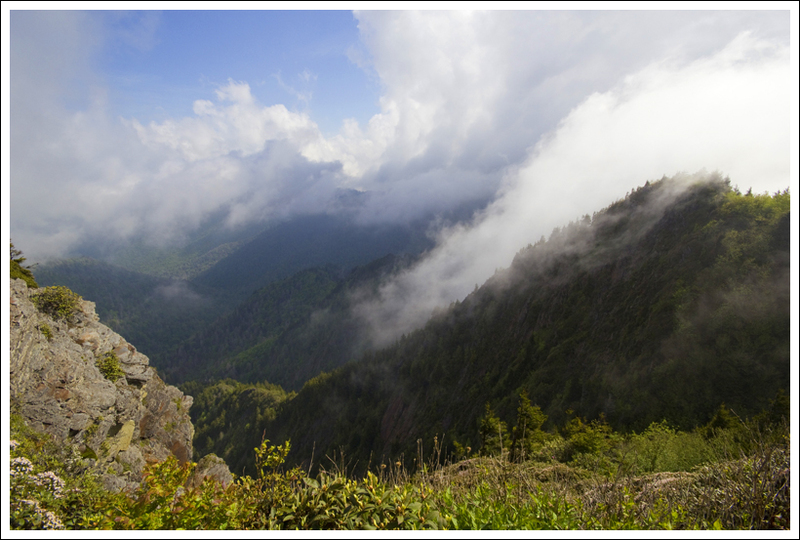 The view from Newfound Gap is absolutely gorgeous, but you’re in for a treat if you continue on to Charlies Bunion and The Jumpoff. When you park in the large lot, you will see a terraced memorial for Laura Spelman Rockefeller, the wife of John D. Rockefeller. It is amazing the impact that Rockefeller family’s philanthropy has had on our national parks. In addition to the Great Smoky Mountain National Park, the Rockefeller family’s donations have given land and money to help establish Acadia, Grand Teton, Yosemite, and Shenandoah national parks. The origin of the rock outcropping being called Charlies Bunion is amusing. A mountain guide named Charlie Conner had a large bunion on his foot and Horace Kephart named it in honor of him and his foot affliction stating “That sticks out like Charlie’s bunion”. Horace Kephart was one of the people that helped get the Great Smoky National Park established and plotted the Appalachian Trail path through the Smokies. This rock outcropping was created through a combination of logging, fire, and flooding. This area was heavily logged in the early 20th century, leaving behind lots of dried debris. A large forest fire came through this area known as The Sawteeth in 1925, destroying much of the vegetation and sterilizing the soil. A torrential cloudburst in 1929 washed away the soil and left this as a rocky outcropping. A view through the ‘smoke’ at Charlies Bunion. Below: The quickly changing clouds and fog opened up new views depending on how the wind blew; The Icewater Shelter. For trail directions, the hike started with an uphill climb just right of the memorial (there is also a small bathroom to the right of the trail) on the white-blazed Appalachian Trail. At 1.7 miles, you will reach the junction with the Sweat Heifer Creek Trail. Continue straight on the AT. At 2.7 miles, you will reach another junction with the Boulevard Trail to the left. You will use this trail to get to The Jumpoff, but we continued straight on the AT. 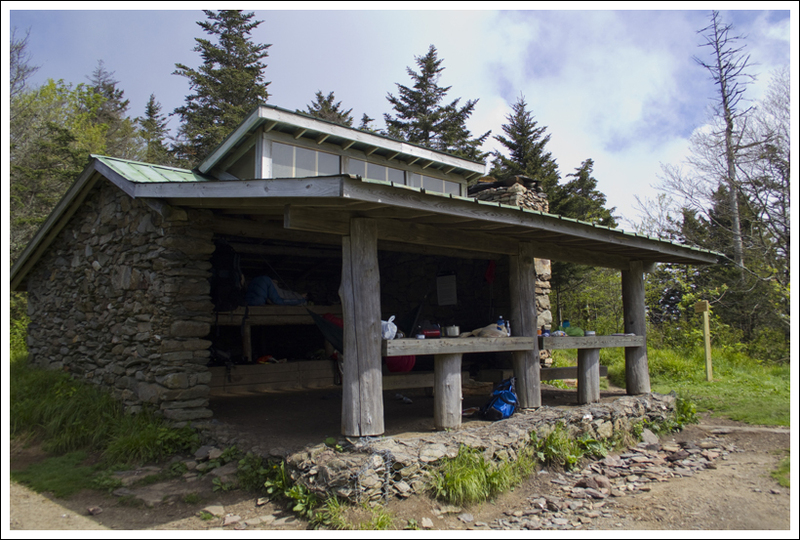 At mile 3.0, we reached the Icewater Spring cabin, which serves as an overnight cabin for any backpackers. On the trail shortly after the shelter, you will see a pipe that serves as a water source if you need water, but you should treat any water before drinking. The trail then begins to go downhill steeply at this point as you make your way to Charlies Bunion. 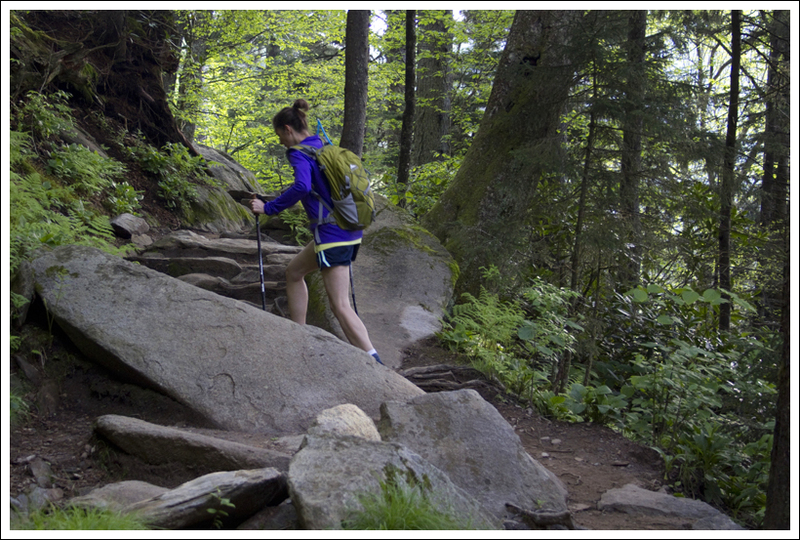 You will reach Charlies Bunion at mile 4.4. 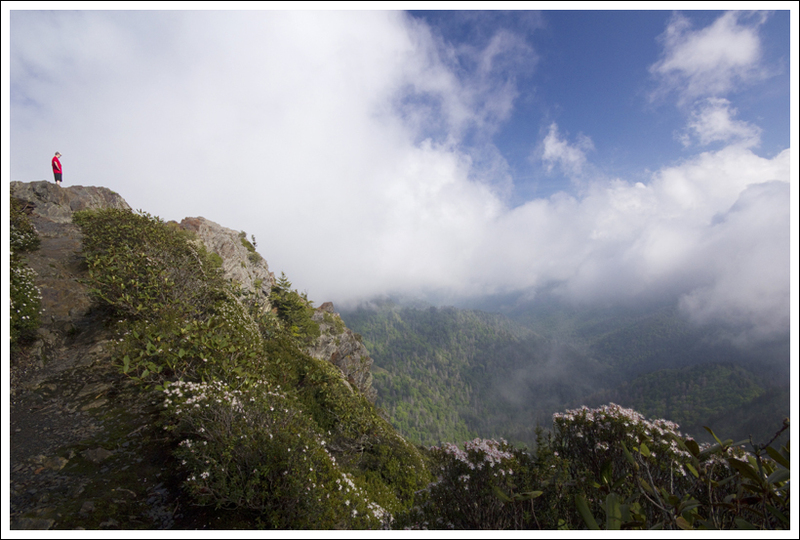 After visiting the Bunion, go back the way that you came. At mile 6.1, you will reach the junction with the Boulevard Trail again. Take a right on this trail and after a very short distance, you will see a wooden sign that points up to The Jumpoff. This trail was definitely the most strenuous of the entire hike. The trail is about .4 miles to reach the end at 6.5 miles. Take a minute to enjoy the view and then head back down the way you came to rejoin the Boulevard Trail and take a right at the junction to rejoin the Appalachian Trail. You should reach the parking lot at 9.5 miles. 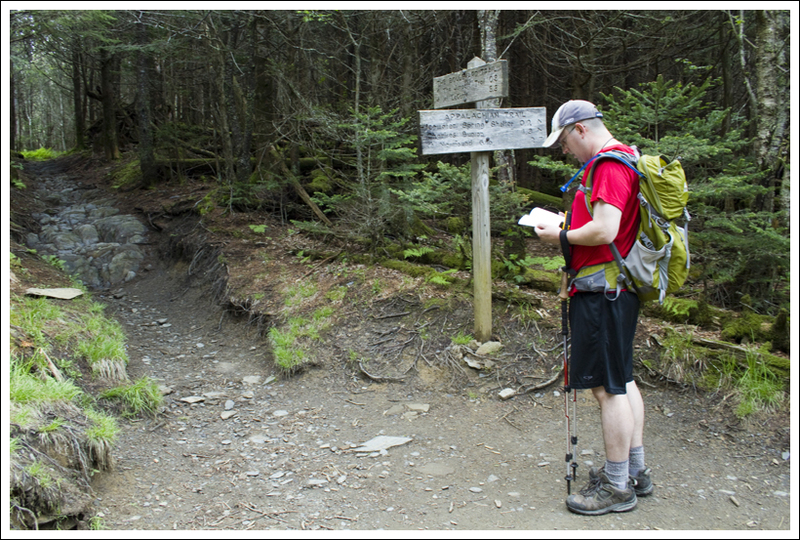 The Appalachian Trail is relatively smooth up to the junction with the Boulevard Trail, but gets rougher, rockier and more slippery as you descend down to Charlies Bunion. The trail up The Jumpoff is the toughest climbing of the day – quite steep and treacherous, so it will take a while to reach the viewpoint. The view from the Jumpoff was pretty impressive! Below: To reach the Jumpoff, follow a short spur from the Boulevard Trail; Adam gets ready to eat lunch with a view; By the time we passed back by early spots on the trail, the view had cleared up significantly. When Christine and I were hiking up past the junction with the Sweat Heifer Creek Trail, the strangest thing happened. We both felt that we had a drumming noise inside our heads that was beating rapidly for a few seconds. I said to Christine, “That was weird” and she asked what I felt. It turns out that she had the same sensation happen at the exact same spot. I’m not sure if it was an adjustment to the altitude, a pulse increase, or an alien scanning us, but it was quite odd. The highlight of this hike is definitely the views. 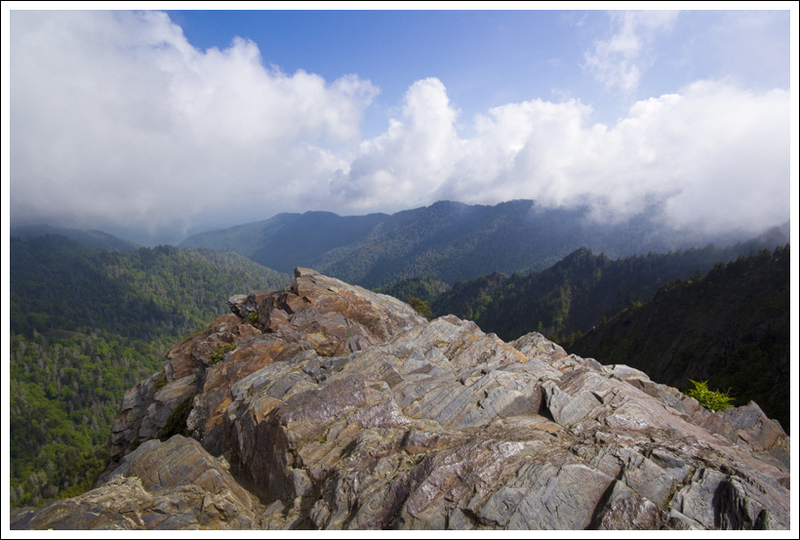 From the Bunion, you can see steep, mountain peaks all around. We were so glad that we stayed around a while to be able to watch the “smoke” rise up and blow over the Smokies. We really felt like we were up in the clouds as the wind blew the fog around quickly. We stayed around at this viewpoint for longer than we normally stay because it was so entertaining to get different glimpses of the mountains. The Jumpoff trail gives you similar views, but you can also see Charlies Bunyon from afar. The Jumpoff did seem a lot more treacherous. The soil is eroding off this viewpoint and you just think if you take a wrong step you could plummet. When we were leaving the area, a large group of older adults were on their way to The Jumpoff. There is not a lot of room at the viewpoint, which made us both wonder how they were going to be able to take the views in. We found someone’s driver’s license at the top of this point and we were just hoping that he has survived. We took it to mail it off to him, but we did check the news to see if anyone was missing. Trail Conditions – 3. The trail is in good condition, but you can expect to hike over lots of mud, loose rocks and roots. It’s just the way the Smokies are made. Streams/Waterfalls – 0. There are no streams or waterfalls along this trail, as it follows mostly ridgeline. Wildlife – 1. Lots of juncos darting underfoot from low-lying plants. We didn’t see anything else, but the Icewater Shelter was closed during fall 2011 for an aggressive bear, so there is undoubtedly other wildlife in the area. Ease to Navigate – 4. Trails are well-marked and blazed. There are several turns, but it would be tough to get lost on this trail. Solitude – 2. 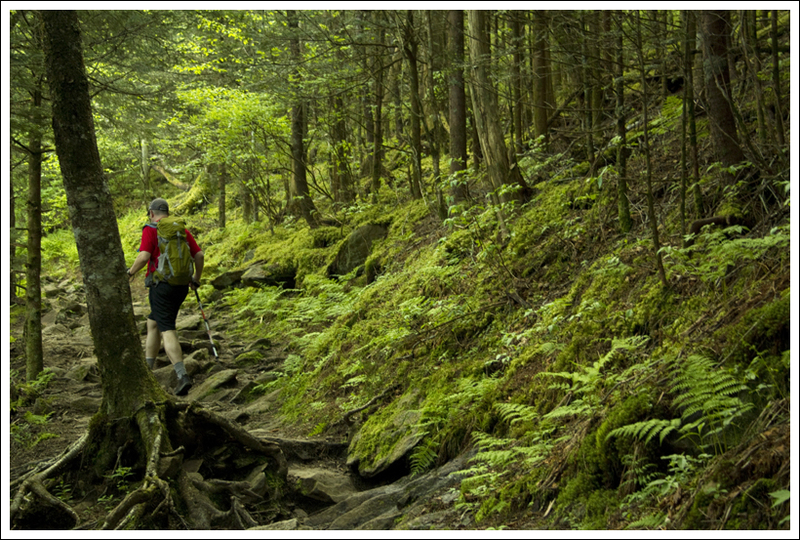 This trail is one of the top five most popular hikes in the Smokies. Hike early if you want to avoid crowds. 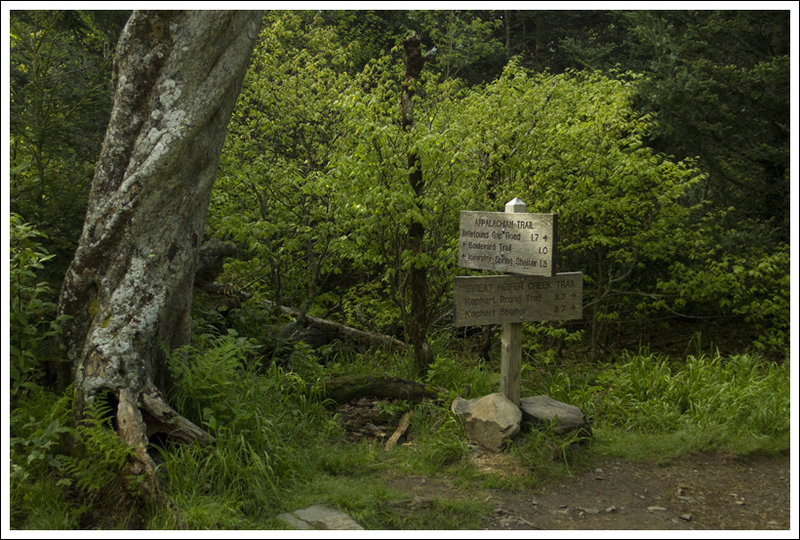 Directions to trailhead: Take 441 through Great Smoky National Park to reach the large Newfound Gap parking lot. Park in the lot and head towards the memorial. The trail starts off just to the right of the memorial. I bet the drumming sound in your heads was a grouse taking off in the nearby woods. I’ve had that happen to me many times and it really does often sound like it’s coming from inside your ears! After some more research and another incident, we decided it was a grouse, too! It’s such a strange sound!